Scroll to the bottom of the page to register. *Registration opens online, right here on this page, Monday, April 22nd. *10 days of simple, clean meals to help propel you along your clean eating journey! Breakfast, lunch, and dinner recipes will be provided for you all 10 days, along with a detailed grocery shopping list. Lunch is mainly made up of leftovers or salad suggestions. There will be suggestions made for healthy snacks you can have on hand. *Designed for anyone looking to clean up their diet. We eliminate common inflammatory foods to help your body heal from the inside out and create true nourishment (what your body craves)! *You can expect wholesome, nutrient dense, recipes void of gluten, dairy, most grains, all artificial sugars, soy, and trans fats. Expect animal proteins, healthy fats and oils, healthy carbohydrates, spices, and fruits & veggies, emphasis on veggies! Please note, my goal is to NOT overwhelm you with all of the deletions. I want to meet you where you are at. This is a group challenge yes but also, a personal challenge. If you simply want to delete gluten but not dairy right now, it is ok. Do not let that stop you from signing up. *Daily motivational emails to help keep you engaged and inspired to make healthy choices. *An optional Exercise Incentive Challenge is included! If you need that motivation to move your body, this will be an invaluable addition! The challenge: 20 minutes of movement for 10 days straight. It can be anything from cardio, lifting weights, yoga, pilates, swimming, riding a bike, going for a walk, etc. that is fun for you. The 20 minutes can be broken up into 2 10 minute segments. 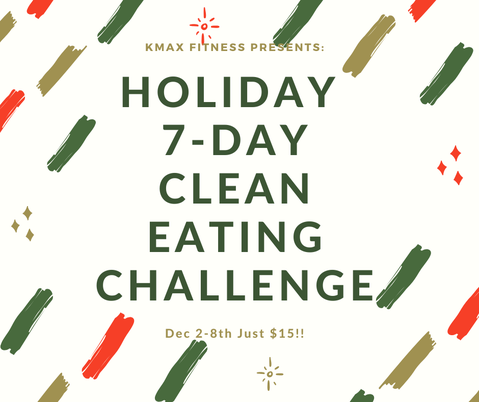 I don't generally recommend 10 days straight of exercise but this is a short challenge and it is designed to allow you to include easier workouts like walking and yoga through out the 10 days. Please listen to your body and input easier workouts when your body is clearly giving you a message! *An optional meditation challenge, 5 minutes each day for 10 days straight. It can be with an app, just breathing, just sitting with your eyes closed, even a 5 minute power nap counts! *Follow along on our private Facebook page during the 10 days for extra motivation and accountability!